The fall down the rabbit hole is a long one – and often very painful. Once you start to deconstruct reality around you, you tend to alienate a lot of people. They are perfectly adjusted and don’t need your philosophical musings, thank you very much. 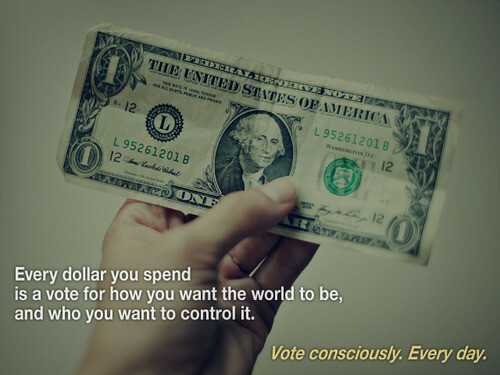 Vote with your dollars is something you will hear well-meaning sustainability-leaning people say a lot. I used to. I still do, to an extent, but it took a long time to realize just how difficult that is. The idea behind voting with your dollars is to put your money where your values lie. If you are against animal testing on cosmetics, you make sure to only buy cosmetics that are not tested on animals. Easy, right? Not so fast. Did you know that The Body Shop (the most famous worldwide company for natural and ethically produced beauty products) is owned by L’oreal? I didn’t, and that’s when I tumbled into this particular rabbit hole. L’oreal is the largest cosmetics company in the world. They own some of the most recognizable beauty brands in the world, like Maybelline, Garnier, Lancome, Giorgio Armani, Yves Saint Laurent, as well as Matrix and RedKen for hair, to name a few. So while you think you have a lot of freedom to choose between brands and their ethics when shopping, in reality, you have very little choice. The money you spend flows one way and that is to the top. Recently, L’oreal acquired one of my favorite brands, Urban Decay cosmetics, whose stance on animal testing used to be ‘We don’t test on animals. How could anyone?’ I don’t think that jives with L’oreal’s attempt to lobby the EU to reinstate animal testing on cosmetics in Europe. How could anyone indeed. So I stopped buying beauty products at the drugstore and Sephora (my favorite guilty pleasure store, which, I found out, is wholly owned by luxury retailer giant Louis Vuitton Moet Hennessy) and I started buying my lotions and shampoos at natural food stores instead. At least this way I could be sure no animal testing and dirty money were involved, right? Wrong again. This is the part of the philosophical musings that takes into consideration the evil of man and corporate greed. Are the two so different? When a pharmaceutical company withholds life-saving drugs for millions of people in the name of patents and profits, should they be tried for murder or celebrated as leaders of industry? In the society we are all so ‘well-adjusted’ to, it’s more of the latter. The stock market is a sociopath’s dream. It has no conscience. Money talks, and even when you have to walk across dead bodies to make a profit, you will be celebrated and envied for it. And the people who are very good at playing the stock market don’t care where their money come from, just as long as it keeps pouring in. As it happens, sustainability is ‘in’. A lot of people want to spend a pretty penny on natural and organic products. What this translates to, in reality, is that as soon as a natural and organic brand ‘go public’ it can be bought and traded on the stock market. Then the big hawks swoop in and buy up the majority shares. They now own and profit from your favorite small business that you enjoyed supporting. This is how the same people end up owning both Whole Foods AND Monsanto. It didn’t really click for me until I read Jon Rappoport’s blog post today. This is how deep the rabbit hole goes. “Take the Vanguard Group. It’s the world’s largest mutual fund company. Corporations, smaller funds, and individuals place their money into the pot, and Vanguard takes it wherever it wants to go. With 14,000 employees in offices in the US, Europe, and Asia, Vanguard manages $2 trillion in assets. This is the world we live in. A place where it is perfectly acceptable to be reaping money from organic food and natural skin care, as well as warmongering, crimes against humanity, GMOs and NSA’s spying games ALL AT THE SAME TIME. Because just like sociopaths, we don’t care where our kicks come from and who gets hurt in the process. But now you know. 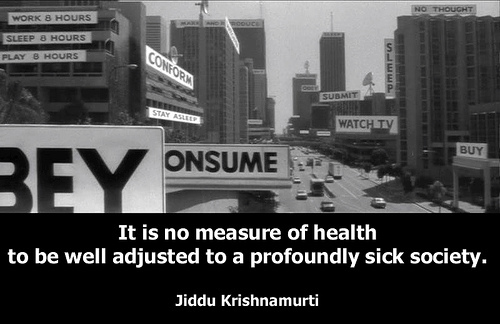 Are you still well-adjusted? I realize it is unreasonable to expect everyone to stop buying stuff. Outside a handful of tribes in faraway forests, the rest of us would perish in a matter of weeks without money and commerce. Honestly, I hardly have any money and I still buy things almost every day. I just bought a new desk (made in Mexico) that I can write at so I can stop writing in bed and wreck my back. I buy vegetables, coffee, milk and fish and I try to get the local and organic kind. I buy $2.5 organic cinnamon buns from my local co-op because they are too delicious to pass up. And I still buy shampoos and conditioner, and recently I had to switch to L’oreal hair care because it is the only product in its price range ($7) that can keep my waist long hair soft and manageable. Does that make me a hypocrite? Should I cut my long hair in the name of sustainability? I look around me and I see people committing way worse crimes against the planet. I mean, some people still eat at McDonald’s. And so the marry-go-round of excuses continues. True sustainability is not a quick-fix, and it’s certainly not a marketing gimmick. It will require a complete overhaul of our values and the way we handle our limited and dwindling natural resources. As long as money is above the law, it will always be hoarded by those who wish to be king. The first step is to expose their tricks. The monetary system is rigged. But there is a world beyond it in our imaginations. The second step is to unlock it. Don’t fall for their call to inaction. Each day we do have a choice. Neo, or Cypher? It’s so much easier to stay in ignorant bliss. To stay in the world of illusion, where even choice itself is an illusion. Because the real choice is not within the picture. It’s whether you step out of the frame. That’s a really nicely written piece. At some point all the little voices calling for reason and the importance of striving towards the greater common good must counter, at least to some degree, the laissez faire, devil-take-the hindmost model which values profits over humanity. I know this post was written two years ago; however, it is still very much relevant. Once you look at money, how it is created, and all the games played with it to rig the game, you really fall into a very deep rabbit hole. All of advertising has only one goal – to separate us from our money. The highest and primary goal of any corporation is to make money for their stock holders. One of my guiding principles is to buy as local as a can, and as close to nature as I can. I grow a lot of my own food, make my own spices and teas from the herbs I grow or collect from nature (it’s really easy once you know what’s edible), buy at farmer’s markets in season, make things from scratch. The more convenience we expect, the more “busy” we are with other things, the more we end up paying with our money and our health. Also, I know a lot of women who’d rather not think about money, or educate themselves about all things related to money – big mistake! The more you know, the more freedom you have to make the choices that really serve you and your family, rather than the 1%. Another information making my life more complicated – but I cannot “un-known” it. What to buy now? If Loreal sees that most of their profits come from products that are not tested on animals then it’s management’s duty to the shareholders to invest more in those areas and less in the lagging ones. This is obviously not an immediate process, but it’s much faster than politics. The only reason why voting with your money may not work is because people just don’t care, they are ignorant or they don’t have time to check every single detail to make sure their facecream does not contain unicorn feces. But then again, you need people who care if you want to change legislation (and I believe the legislation should be changed to make the basic human rights applicable to all sentient beings [obviously a pig can’t vote, but it can darn well enjoy a good life]). The system is not perfect but it’s the best we’ve come up with. I recommend we buy products and invest in companies that align with our values. The first is much easier than the other, but there are a few ethical fund around (not just socially responsible ones) that help a lot, often without hurting your ROI. Another reason “voting with your money” doesn’t work is because 90% of the money (votes) belong to 10% of the population. Or rather corporations. So even if “the 99%ers” all voted one way, just a few paltry bribes/lobbying in the right places can undo/negate all of your pathetic attempts to support “sustainable” practices. Yes! That is a great point. Corporations pretty much have all the money already and there is only minor things we can do to influence them. Unfortunately. But we still have to try of course. I like your anger, stay angry. I hold onto George Bernard Shaw’s comment that ‘The world will never be changed by a reasonable (person) man’. It is always possible to be reasonable and justify the actions of big business when they return ‘value’ to shareholders and pension funds, but the damage they cause anloing the way is not counted in this ‘value’. Encourage divestment from fossil fuels, arms manufacturing and unsustainable processes. Keep it up! No easy answers or quick fixes and, as you say. Values need to change first and then new skills promoting self-reliance need to be learnt. There is so much in western societies that we think we can’t do without, yet billions of people do. We all just need to make a start and keep going. Inspiring and supporting each other is a good place to start! Beautifully written post! A lot of people think that being sustainable means to find an alternative way of consuming, which can be never-ending because every solution has its fault. But like you mentioned, all of us have to remember that sustainability really means just learning to consume less. Thanks for sharing the research! Fantastic! I posted to the fb page of the community group I run, Reuse and Recycle, Cairns. We raise only enough cash to have things tick over, and when there is enough to provide a small income to another the wage is capped at $300 p/wk. Unfortunately, utility companies won’t take trade in secondhand jewellery, recyclable crafts, or swaps of our skills and services ~:-) We use an Honour System to ‘redistribute the wealth whilst caring for country and community’. Haha, don’t worry about it :) I applaud your efforts and I look forward to reading more from your blog! Fantastic! I have posted to the FB page of the community group I coordinate, Reuse and Recycle, Cairns. The model I govern the group with shifts the focus on dollars; some is needed cause phone and internet companies won’t barter for used jewellery, fruit n vegies or our wealth skills, competencies and resources. Our goal is greater community resiliency thru enhanced networking based on an Honour System (my sword is my tongue for those attempting to take advantage of Trust; and I take legal action when deemed necessary). Thank you so much! I’m flattered you would share it :) It sounds like you are really understanding the deep changes needed in our society to achieve true sustainability. I also think increased trust and strengthened communities are going to be key elements, and I think we are going to find we will be much happier for it, too. It’s hard to get started, and widespread changes will be slow but I believe all our tiny steps will add up eventually. Excellent post. It does in the end come down to ‘Personal responisiblity’ and understanidng we are part of something bigger and what we do matters. So as you close with we can’t allow ourselves to fall into ‘inaction’, as even each of us doind small things leads to something bigger. The world is complex, but you still have choice and your money still counts. Buying from the Body Shop does not promote animal testing. 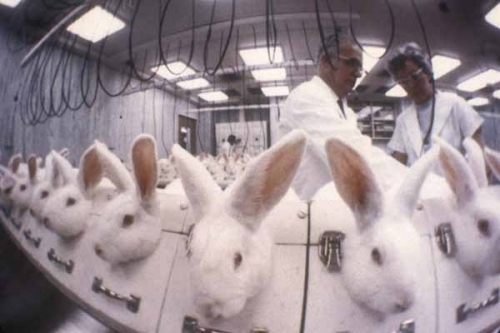 If all consumers bought from the Body Shop, L’Oreal would soon stop lobbying for animal testing. If consumers don’t care, they get the world others choose for them. I just came across this post and am reblogging it as it is very well thought out. On a daily basis I find “it ain’t easy being green”, but every little step we take in becoming more responsible for the world we live in will add up. We just can’t take one step and feel we’ve “done our part”. We have become complacent, and therefore complicit. Make informed choices and keep opening your eyes wider and wider. This is a really great post with lots of food for thought. I know that I often think that the only real power that “we” have is consumer power. Unfortunately, “they” have gone to great lengths to make sure that it appears that there are lots of choices when that is not actually the case. Sad state of affairs (luckily, that means that there are ample opportunties for improvement). That being said, I would love to reblog this post with your permission. Wow. This was a fantastic post! You make some really wonderful connections and you raise some very important points. Would it be possible for me to reblog this on my blog? Thanks! Great post. Living a sustainable life takes work. Thanks for sharing the information. Many thanks, also, for stopping by my blog. I appreciate it. Thank you for your commentary. 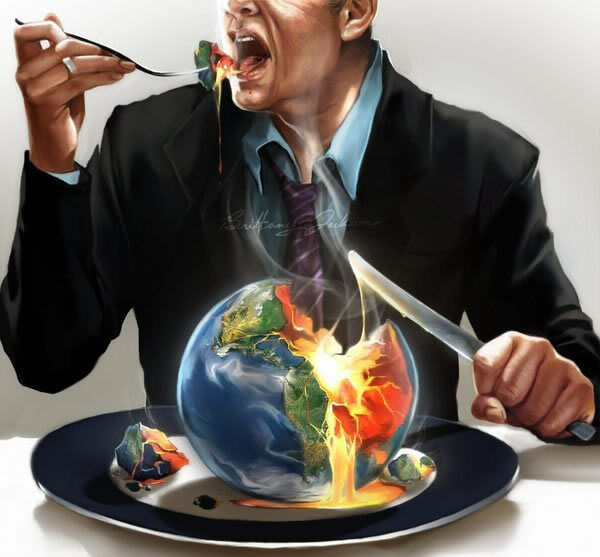 The global corporate model has been absolutely disastrous on people and the environment, and I think we are just beginning to wake up to the extent of it. Hopefully we will change things around before it’s too late, and while I don’t mean to discourage people from consciously spending their money, it is merely the first step in a long, long awakening process. Right now I am excited to one day have long, witch-y gray hair but talk to me in another 20 years and I might have changed my mind ;) Rock on, yougetshownthelight, I wish you happiness and peace. So now I rebloged your post, again thank you for the inspiration! I’m sure it’s out of self-interest but gives faint hope that the people to whom the money flows might be getting the point at last and have enough dollars to make a difference. Or am I being naive? Hey thanks for bringing rabbit hole details to the forefront. I love fashion in a very conflicting way. Thanks for your comment! Ethical investment is definitely one of the best ways to put your money where your values lie. The example block quoted, Vanguard Group, opened an Australian branch in 1996. Their website quotes more than 13,000 employees worldwide and 3+ trillion assets managed (as at 31 Dec 2013). Great blog! I, too, am continually wrestling with how to get a toe hold on this mountain of greed and control. I especially like this line, because I believe that this is what’s necessary: “It will require a complete overhaul of our values and the way we handle our limited and dwindling natural resources.” A society-wide values transformation is what is needed! Thank you so much :) of course you can reblog this post. It’s always really exciting when someone connects with the same issues as myself! Great! Let me do it straightaway! So true. It’s frustrating to think of these kinds of connections because it makes one feel as if they can’t make a difference…but I think we still can. By doing our best…buying local, organic things whenever we can, and NOT buying things that are not (abstaining from consumerism in general is a statement in itself). I’m nowhere near perfect at doing these things, but I do the best I can on a daily basis. And I think being conscious of these things is the first step in the right direction. Hi, Joey, thanks for your feedback. Yes, we are essentially vegetarian here in Mumbai, and my family, thankfully is completely vegetarian. But the awareness regarding organic foods and products is still just gaining ground. I have thought about having a small vegetable patch in my home at least for some simple veggies like chillies and beans and tomatoes seem to be easy to grow out. But living in urban apartments does not give us the luxury of too much space. But yes, connecting with these thoughts, connecting with like minded people and consciously being aware of what we are buying: and BTW kids love McDonalds… so helping them understand that these foods are not ideal for us can be an effort in the right direction. I would like to read up a little more on this thing you mentioned in the original post about how large corporations are controlling our buying behaviours. please do let me know if you have some links to share and the community initiatives being taken to get back to safer, local and greener living styles. would like to read up on the same. Joey, this is the exact question that i asked a blogger friend earlier today: yes, we all know something needs to be done, our waters, our air, our land are all a mess. We all know what needs to be done, but how do we as individuals drive our activities to correct the errors that have been committed over the last couple of hundred years. The large corporations and their ways are one issue we are dealing with, and we all complain that it is wrong. Yet, as you have rightly said, we continue to buy from them, and put money in their coffers. Great post… may you inspire more people to thought and action. Hi Bharti. Thanks for such a thoughtful comment. I struggle with the same ideas every single day. I really have very little money but I live with my beautiful family whose values are the same as mine, and we only buy organic and healthy food. I know a lot of people can’t afford that but for us it is an investment in health and we are rarely sick, so that saves a lot of money spent on doctors and medications. So if you can. the first thing I would refuse to buy is any sort of processed food and drinks and big corporations – that means no McDonalds, Cokes, Fanta, candies and chips. I don’t know what food you have available in Mumbai since I have never been there but isn’t Indian food mainly vegetarian and you can’t go wrong with home-cooked vegetables :) I like to start with food because it’s something we have to have and buy no matter where we are in the world. Then just tell your friends and family why you are doing what you do. Tell them about unhealthy food from giant corporations and how they have no interest in keeping us healthy. The journey to awareness has to start somewhere and food is something we all have in common. Intellectual knowledge is very important, of course, and now that we all have the internet we can research and learn about the corporations and the grinding poverty that keeps us more or less slaves to the financial system, but more important than even that knowledge is understanding the stories we tell ourselves about what has value in this world. That journey is long and deeply personal, but I’m trying to explore mine in this blog and I hope some of it may help you on your journey as well. I think you are on the right track just asking the questions you do and I’m happy you found your way to my blog. I don’t know if that answer helped you but I really think until a lot more people are on the same page intellectually and spiritually about the state of the world, we won’t see the kind of mass movement we need to truly change things around. So true. And small-scale change is really all we have, until corporations have a benevolent change of heart. Unlikely. The only hope we have is that these sustainability “trends” become profit drivers, because only in profit, or the potential for profit, will corporations begin to change course on these behemoths they’re running. Who is going to pay for cleaning up the oceans, or for the health costs of eating such toxic meat? Certainly not the corporation although, at the end of this round of monopoly, they will be the only ones left with any money at all. Well written. Enjoying your perspective on some of these things. Glad to see this explained so well. We need to find our support, as much as possible, within our own communities, and refocus on what is really important, not just what is “in vogue.” Thank you for your words.